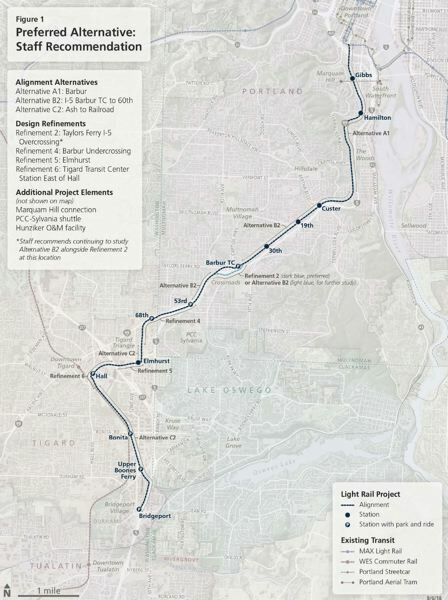 One year ago, Mayor Ted Wheeler upended the planning on the Southwest Corridor MAX line by announcing he had asked TriMet to contribute $100 million for affordable housing — and TriMet had not yet agreed to do so. A lot has changed since then, including a complete takeover of the financing plan for the proposed light rail line by Metro, the elected regional government. Metro has also referred a regional $653 million affordable housing bond to the Nov. 6 general election ballot, and has helped complete a Southwest Corridor Equitable Housing Strategy that the City Council adopted last Thursday. Wheeler praised the strategy for tying "transit and workforce housing together" in the corridor. What hasn't changed is the lack of enough money to meet the affordable housing needs in the corridor, however. The strategy adopted by the council on Oct. 4 shows that the $100 million Wheeler asked TriMet to contribute was just a drop in the bucket. It says that if the MAX project proceeds, 15 times that much money — $1.5 billion — needs to be spent on affordable housing and rental services in the corridor in the next 10 years to minimize the displacement of low-income households there. According to the strategy, 4,140 new publicly subsidized homes must be built in the corridor by 2028 to meet the needs of the lower-income households expected to be living in it. Now, as the council prepares to review the recommended route for the proposed MAX line on Wednesday, the strategy confirms the magnitude of the challenge facing governments in the region that agree addressing the affordable housing is their number one priority. The $1.5 billion the strategy calls for spending in the corridor is more than twice the $653 million Metro is asking its voters to spend in the entire region. It is unclear where all of that many will come from. The strategy calls for spending an "appropriate portion" of the funds from the Metro bond in the corridor if it passes. It also calls on the council to create an urban renewal area in the corridor that could generate up to $54 million for affordable housing projects. But Commissioner Dan Saltzman called that amount "low," given the needs in the corridor. The strategy does recommend where the money should be spent, however. Among other things, it says existing "naturally occuring affordable housing" apartments should be bought and preserved. And it says multifamily buildings with 100 or more units should be built near each of the 10 new stations along the proposed MAX line. Station locations are identified in the recommended route the council will consider on Oct. 10. Most are along Southwest Barbur Boulevard/Highway 99 West near major intersections and such busy destinations as the OHSU campus on Marquam Hill and the PCC Sylvania campus. One is near the Tigard Transit Station and another is at Bridgeport Village. Wheeler revealed his fruitless discussions with TriMet during an Oct. 14, 2017 community forum on affordable housing in the corridor between Portland, Tigard and Tualatin. At the time, the transit agency was working on a regional transportation funding measure for the November 2018 ballot that would help pay for the proposed MAX line it would own and operate. TriMet staff responded that the agency cannot legally spend money on housing. The forum was part of a project Metro has already begun, to develop an affordable housing strategy in the corridor. Project partners included Portland and Tigard. It produced the strategy adopted by the council last Thursday. Among other things, it found the area is already home to more than 10 percent of the region's population, with more than 70,000 new residents and 65,000 new jobs expected to be added by 2035. The strategy calls on Portland to spend $830 million to produce 2,560 new affordable homes over the next 10 years. Tigard is asked to spend $550 million to produce 1,580 homes. Shortly after Wheeler spoke up, Metro took over planning the transportation measure and pushed it back to the November 2020 ballot. The Metro Council then voted to place its $653 million affordable housing bond on the November 2018 ballot instead. It has not said how much of the money will be spent in the corridor if the measure passes. That decision will be made by Metro in consultation with Portland and the housing authorities of Multnomah and Washington counties after the election. Metro would also have the authority to spend 10 percent of the bond funds to buy land along transit lines for such projects, and at least some of that money will presumably be spent in the corridor if the measure passes. Wheeler urged voters to pass the Metro measure and a proposed amendment to the Oregon Constitution that will allow the money to go farther at the end of the hearing. To read the Southwest Corridor Equitable Housing Strategy, go to www.portlandoregon.gov/bps/73445.